The boy has won the gratitude of children around the world who are still trying to counteract the negative parental effects of the Video Games Probably Make Kids Dumber Study. 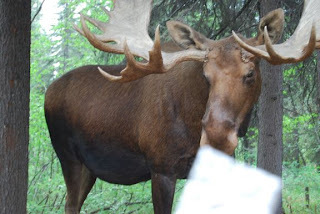 I can hear the pleading now: I may be dumber, but I will be able to save little Isabella from a moose (Isabella is the most popular name for girls in New York State in 2009, and the probable name of most little sisters). Fear not POTUS fans, this collector tamed her moose with a pewter cracker. We've got the Key To The City! Walking Man: Don't Tread on Me. Chupacabra Tacos grilled to perfection! Big Apple BBQ was smokin!